Major US cities are reporting their first gains in monthly home prices in nearly three years, according to a recent report from the Wall Street Journal. Home prices in 15 of the 20 metropolitan areas studied were up, or remained stable, suggesting evidence that the slowdown could be easing. The National Association of Realtors® (NAR) also reported increased sales of new and existing homes through the month of June. Existing home sales - including single-family, townhomes, condominiums, and co-ops - increased 3.6 percent in June. Analysts are projecting an increase in 2009 existing home sales to a seasonally adjusted annual rate of 4.89 million units. Where does Cincinnati stand related to these national statistics? In June, 2008 the Cincinnati MLS recorded 1,988 closings and in June, 2009, they recorded 2,171, up 9.2%. Comparing May, 2009 sales of 2,064 to June, 2009 sales of 2,171, the sales were up 5.2%. Some of that can be contributed to the time of year, but nationally, it is a trend everyone wants to see. Cincinnati’s numbers are better than the National Association of Realtors numbers in both cases. Inventory is gradually being absorbed. The months of new home supply has fallen from its high of 12.5 months to inventory to 8.75 months. The months of existing homes supply has gone down from 11 to 9.5. And the median sales price is rising from its low of $165,000 to 181,000. All of these signs point towards an end to the buyer’s market. But, it’s only a Buyer’s Market if you BUY! 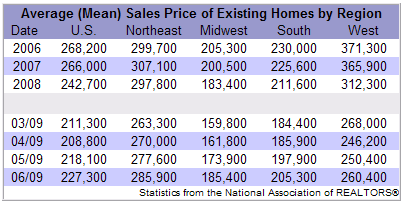 "The increase in existing-home sales occurred in all major regions of the country," said Lawrence Yun, chief NAR economist. "We expect a gradual uptrend in sales to continue due to tax credit incentives and historically high affordability conditions."